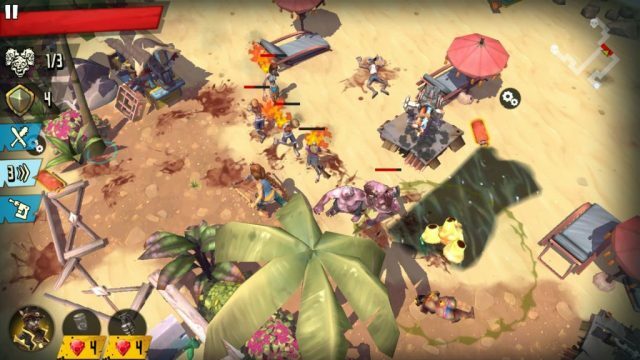 Dead Island: Survivors combines action-packed zombie hack and slash with tower defense elements. The game lets you rescue survivors by placing traps between a zombie wave’s spawn point and the electric fence, which serves as the last line of defense. You will also be collecting epic characters such as Sam B, Cody Richards and Logan Carter to eliminate incoming zombies. You can equip weapons to a hero and control him/her to curb the undead menace if zombies get out of hand. Along with rescuing people, you will also undertake changing missions, that include repairing traps before zombies reach their destination, collect crates before the timer ends and many more. The Dead Island world is divided into several tiny islands. Each island looks beautiful from a bird’s eye perspective. The hand-drawn visuals are a feast for the eyes and the animated zombies are fun to watch, but from a distance. There are various types of fragile, strong and extremely dangerous zombies, but they have their own strengths and weaknesses. Fortunately, you have one of many slick heroes and several strange but handy devices to exploit their weakness before they gorge themselves on human flesh. When placing traps and barricades, you may have noticed red arrows. These arrows form a zombie’s path that ultimately leads to the electric fence. They start from various spawn points. Eliminating zombies can be tough if the paths are separate and far away from each other. It won’t be easy killing zombies that attack from different directions, especially when you won’t be having too many traps to place near each path and there’s only one hero defending the fence. In such situations, barricades can come handy. Zombies don’t attack barricades; they just switch to a different lane if blocked by them. You can place barricades in such a way that enemies are forced to take an alternative route to the fence and their path is merged with another path that emerges from a different spawn point. You can use barricades to connect structures and ruins so that the paths of zombies that arrive from two different entrances merge together. When paths merge, you will see more than one arrow. Make sure there are stronger traps placed around merged paths so that they can take down as many zombies as possible. You can also move your hero to deal extra damage since all zombies will be concentrated on a combined path. Just make sure that all paths have been merged, traps are assembled on the altered lane and are positioned strategically to thin the herd. Tap the fist icon on the island map and a zombie horde info card will be displayed on the screen. It will show the difficulty level, enemies, weakness and rewards. The “weakness” section is very important as it will help you determine which towers will be more effective against enemies. Just tap the icon under it to know how it will affect enemies. So if there’s a “fire” icon, it means zombies are weak to fire and will take 50 percent more fire damage. You should place fire type traps and choose heroes equipped with weapons that deal fire damage. For example: You can place flamer towers on strategic points and equip the Sizzle and Frizzle weapon to Marshanda to inflict fire damage to zombies. Besides knowing the predominant weakness of enemies on a particular map, you should also check each zombie’s weakness. You can do this by tapping a portrait of a zombie under “Enemies” to know its strong and weak points. For example: Stinker, a type of zombie, is weak against an acid attack – you can place the Liquidator tower to bring her down. However, when killed she disables nearby towers if they are within the range of her dead body. The slimy green circle around her shows her range and if a trap falls under this, it stops working for a few seconds. You will have to make sure she does not fall close to a tower and so you will have to lure her away from towers and then kill her. In Dead Island: Survivors, zombies follow the path, so placing traps along the path would be an ideal way to deal with them. However, it depends on the map, the towers you can use and the spawn points. As discussed in the first tip, you can force zombies to change their path using barricades and then place a series of towers strategically alongside that path to attack them creating a maze like layout so that the undead is forced to move along the path. Place more than one trap facing each other (Read Tip no. 4 to know how to do this) on strategic points, such as a junction where two zombie horde’s paths merge. You can move your hero to such an area to attack them and since they will also charge at your hero and won’t move from that point for some time, this is where traps can be very useful as they will do their job, frying zombies while your hero keeps them busy. Cannons are very useful in maps with environmental traps such as spikes, holes and water bodies. Since this tower fires cannonballs right at zombies, they not only inflict damage, but also push them back and knock them down. However, its rate of fire is slow and it fires 3 cannonballs per attack, which is why you should place it opposite other traps. When it fires, it will push zombies into those traps and instantly kill them. 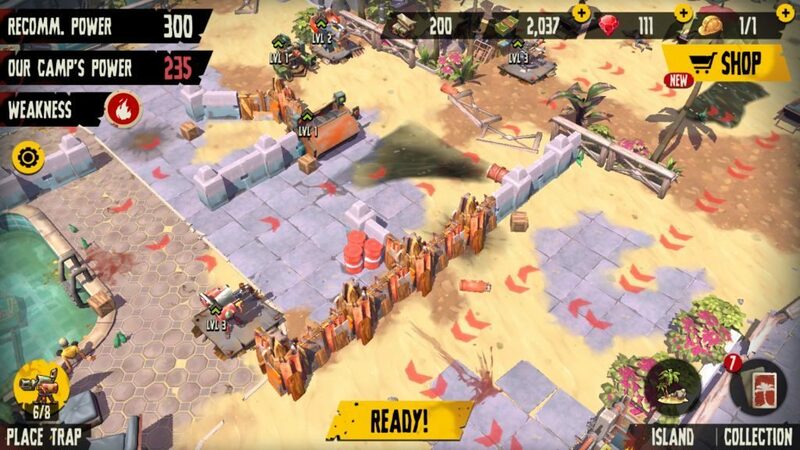 Make sure you get the position of a cannon right – Tap to rotate it in 90 degree increments to get to a good position, so that zombies come within its range (shown in yellow) and are pushed into environmental traps. You can also place it opposite other towers. If you place is opposite a flamer tower, leaving some tiles free between them, it will push zombies towards the flamer. Using this trick, you can double damage to enemies. You can also move your hero near cannon and beat up stronger zombies that are pushed back by a cannon trap to squeeze out any remaining HP from them. 5. Should You Boost Towers? Boosting a trap will increase damage, which can be of some help to get rid of stronger zombies. Before giving your tower that much-needed attack boost, please not that boosting it does not level it up. To level up a tower, you will need a certain number of duplicate cards. You can level up a trap card any time if you have enough cards and cash in hand. However, you will have to place a tower on a map and then tap to boost it by tapping the tiny yellow button. You will need metal to boost a trap. Bear in mind that a trap will be disabled while it is being upgraded. So don’t start that game yet. Check the “ready in” section to see how much time it will take to boost it. If you are planning to boost traps, then try to upgrade those that are stronger than enemies. So if zombies are weak to fire, then you should boost fire traps to ensure they instantly eliminate all zombies. When the game begins, survivors hide behind an electric fence. When zombies try to break the fence they get zapped and are killed instantly. But it also reduces a fence’s “charges” (displayed by shield icon on the map) making it weaker each time a zombie tries to enter it. You will have to increase a fence’s charge to kill more zombies. Collect duplicate electric fence cards from suitcases and then upgrade the electric fence using cash. Red Barrels: They explode, ripping apart zombies that are within their range. Tap a red barrel when there are multiple enemies in close range. Yellow Barrels: They send a shockwave that stuns nearby enemies. Make sure there’s a tower close by as it can eliminate stunned enemies hit by the stunned enemies. Blue Barrels: Tap on a blue barrel to freeze zombies. Just make sure you don’t have a flamer nearby as it will melt the ice. Placing a cannon trap close to such barrels will help finish off frozen zombies.